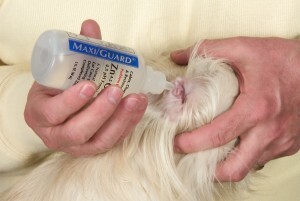 MAXI/GUARD® Zn4.5 Otic® provides veterinary medicine with its first complexed zinc ear care topical for otitis externa. The formula delivers the essential micronutrient zinc, complexed with select amino acids and the proven Malassezia agent, Boric Acid. Active ingredients are delivered in a well tolerated propylene glycol vehicle at a pH of 4.5. Resolves difficult ear cases associated with Otitis Externa while aiding in the healing of the ear canal. 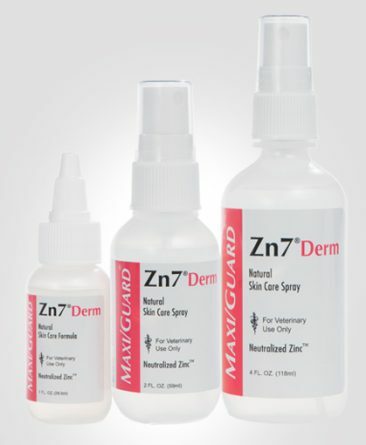 MAXI/GUARD Zn4.5 Otic is the first water soluble ear maintenance topical offering veterinary medicine the essential micronutrient zinc, complexed with two select amino acids, Taurine and L-lysine, in combination with boric acid, a proven anti-Malassezia agent. The amino acid complex stabilizes the zinc ion for better topical utility. Zinc is an essential trace element and is a component of about 300 metalloenzymes systems. Many of these enzymes play key roles in extra-cellular matrix remodeling; wound healing, connective tissue repair, inflammation, and cell proliferation. Zn4.5 Otic is ‘First-Line’ for fostering healing or returning the micro-environment of the ear to normality. Chronic Pseudomonas ears require powerful antibiotics and steroids, but Zn4.5 Otic can be used as an adjunct in these situations for restoration in a shorter period of time. Zn4.5 Otic is very effective and safe for long term maintenance. 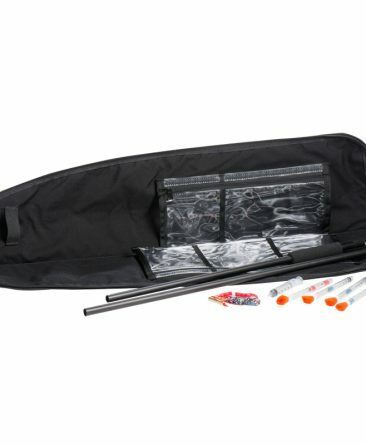 Once the initial problem is resolved, the product can be used 2-3 times per week to prevent future outbreaks. Due to the large number of clients using Zn4.5 Otic for maintenance or prevention, we have a more economical 4 ounce size available. 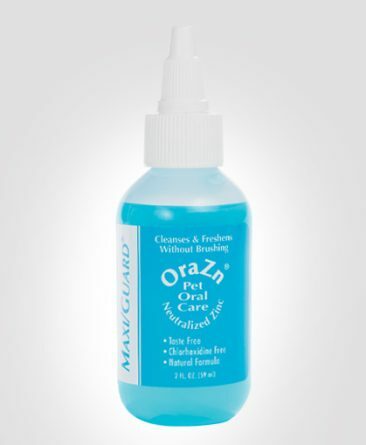 MAXI/GUARD Zn4.5 Otic is a very safe product. Zinc gluconate and the amino acids Taurine and L-lysine have wide margins of safety. 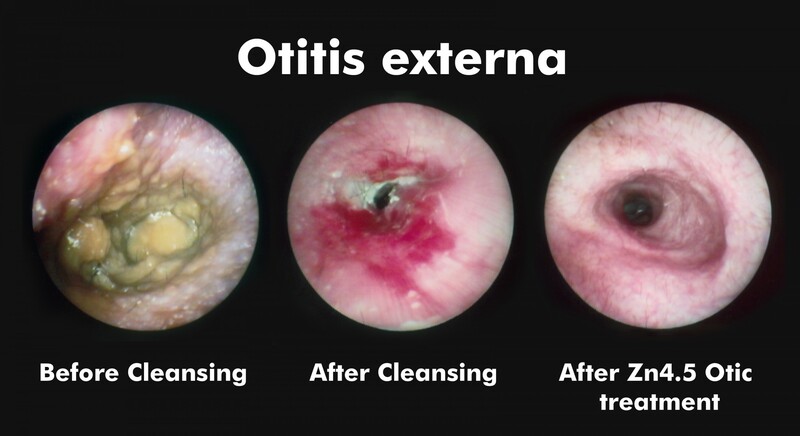 Zn4.5 Otic is even safe in cases where the tympanic membrane is ruptured and will not cause ototoxicity or other side effects. This product is safe and effective for various problems found in the ears of dogs, cats, rabbits, ferrets, and other animals. Due to the zinc and amino acid utility, this product works well without the extremely low pH or higher concentration of boric acid in other ear car products. 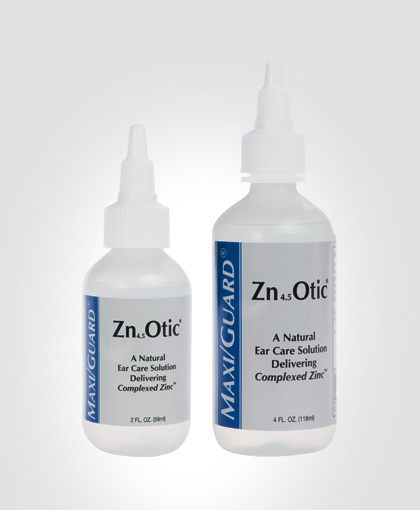 Zn4.5 Otic is well tolerated in most ear care situations. Have an unpleasant odor coming from its ears? Have a discharge coming from its ears? Have red, swollen ear canals? Show signs of sensitive/painful ears? If you answered yes to one or more of the above conditions, please schedule an appointment with your veterinarian soon. 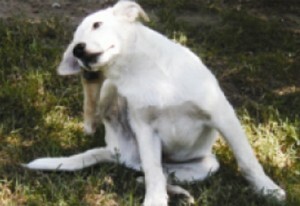 Your pet may have Otitis Externa or another condition which requires immediate veterinary care. How do I apply Zn4.5 Otic? 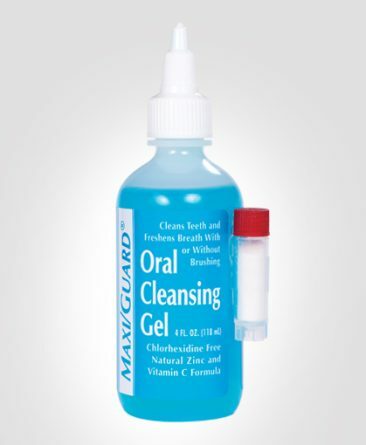 The ear should be cleansed with a suitable cleanser before a regimen of treatment is started. Instill 5-8 drops once to twice daily into the vertical ear canal, gently massage and then wipe away any excess with a tissue. 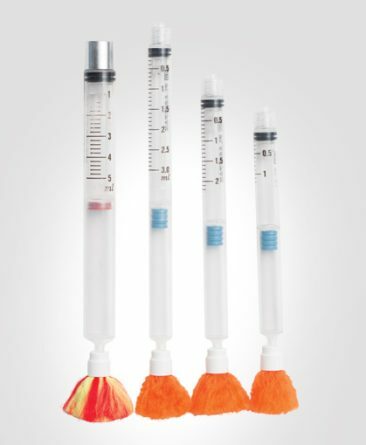 The attending veterinarian may desire to initially immerse (flood) the ear canal fully in the clinic before sending the product home with the owner. Top 10 Reasons Pets Visit Vets: Ear infections top the list.